Here’s something you should know about me: I live for splurge meals. My absolute all time favorite foods usually fall into this category. In my normal routine, I try to adapt some of these recipes into clean versions, but on splurge day anything goes. Fried stays fried, pasta stands in for itself, and I put cheese on my half too. It took me approximately 2 seconds too decide what tomato week’s splurge recipe would be. 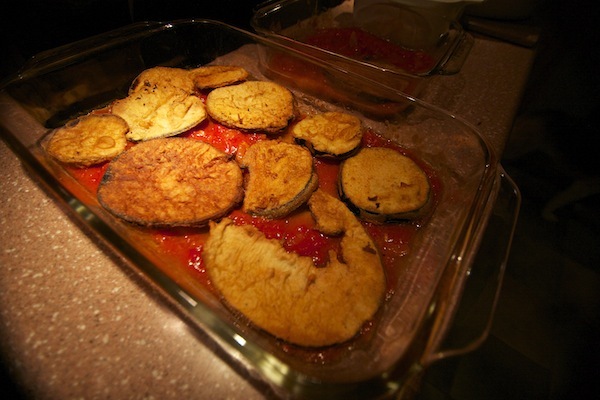 Growing up, my dad (originally from Italy) would make his eggplant parmesan maybe once or twice a year. It’s not a quick undertaking, and I knew it was a big ask to see if he would make it with me so I could blog about it. The thing is, what I really mean by “second generation style” is that I want to learn how to make this dish exactly like his, because it is absolutely perfect. The effort is always worth it. Plus, it makes your house smell sooooo good. Best of all, eggplant is in season right now and I can’t help but pay thanks to this versatile crop. What a fine nightshade you are, eggplant. Thanks for being you. *Note: Since this takes a few hours, I usually make an extra batch to freeze or give away. Cut everything in half if you are only making one dish. To make your batter, combine flour, salt and pepper in a large bowl. Add eggs, lightly beaten. Once well mixed, start adding water about a half cup at a time. The batter should be the consistency of runny pancake mix. 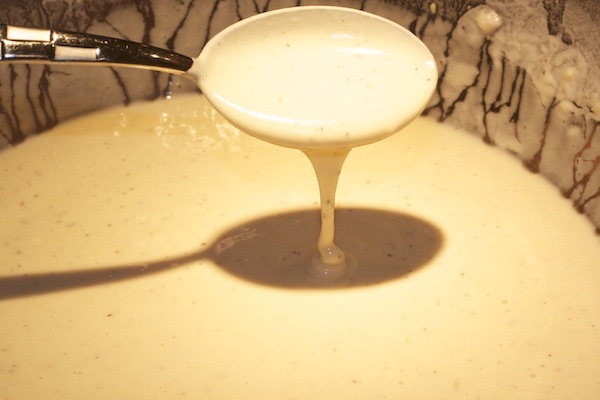 Keep adding water and mixing until the batter is thin enough that it will run off the end of a spoon easily. There should be no lumps. 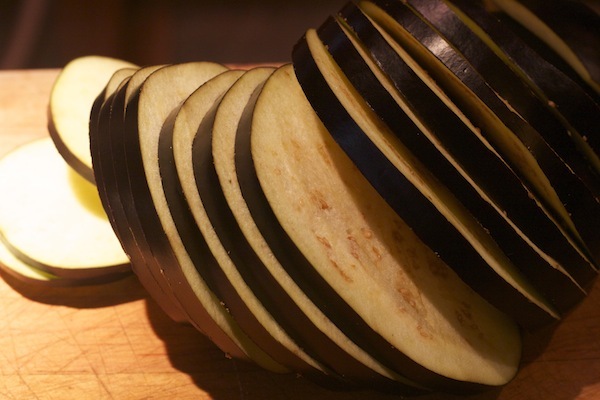 Next, trim off both ends of the eggplants and slice them about 1/4 inch thick. Do your best to keep the thickness consistant so the pieces cook evenly. Meanwhile, in a deep saute pan, heat up 3/4 to an inch of cooking oil on medium heat. Test the oil temperature with a drop of water or batter. It will sizzle when hot. If you have a thermometer, oil temperature should reach between 400-450 F.
Once the oil is ready to go, dip each slice of eggplant in the batter and just cover both sides. 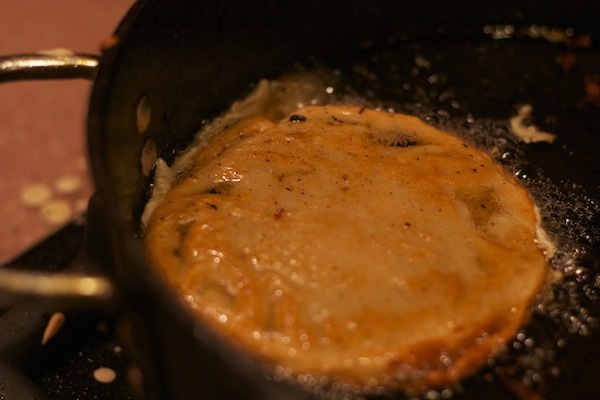 Let any excess batter run off, and then carefully place in the hot pan. 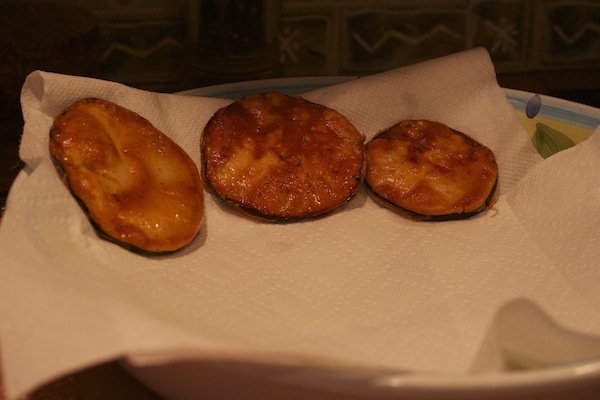 When the underside becomes golden brown (1-2 min), flip them over and fry for another minute or so. 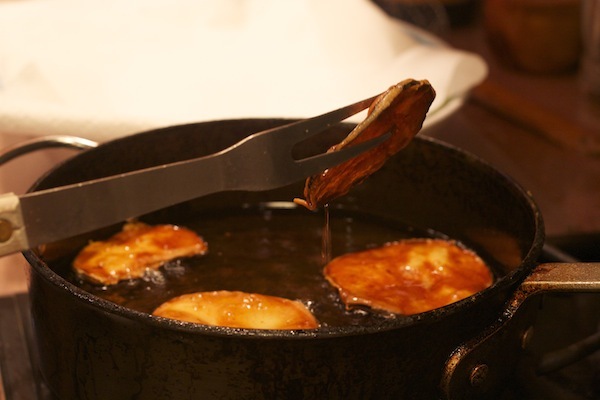 When cooked, drain each piece of excess oil as you remove them from the pan. As the slices come out of the fryer, lay them on a plate covered with a paper towel to soak up extra grease as they cool. 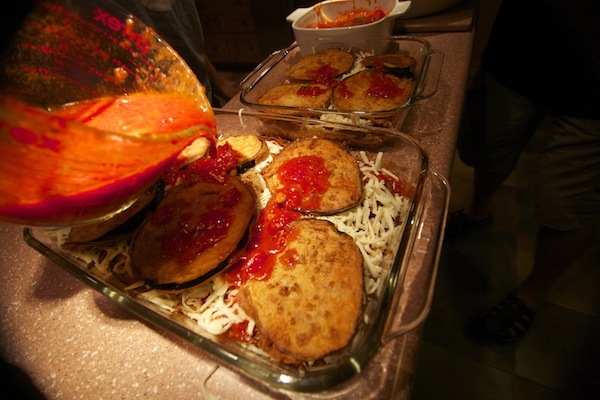 While the eggplant is frying, grate your mozzarella and parmesan. 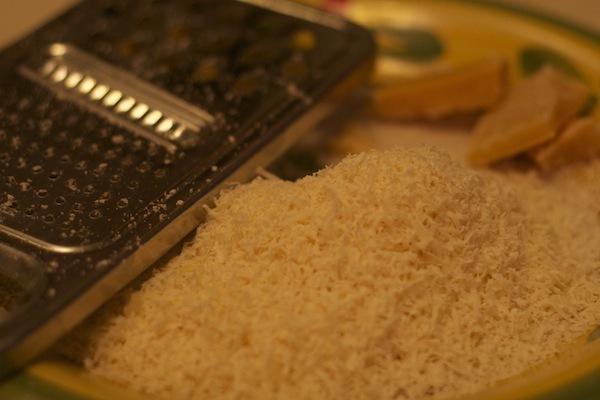 To make grating easier, place the cheese in the freezer for 15-20 minutes first. 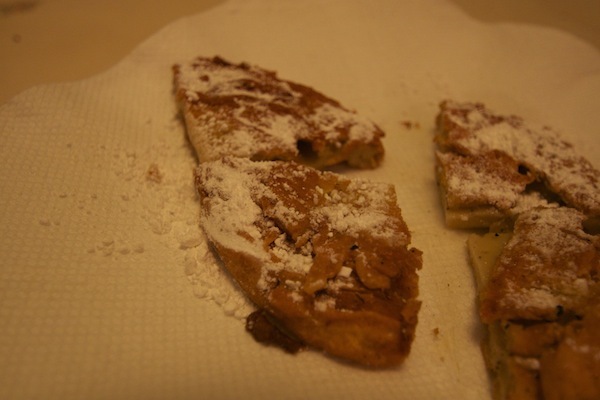 Now is also a good time to preheat your oven to 375 F.
If there is any batter left over when the eggplant is done, you can pour it into your hot oil to make a zeppoli, or fried dough ball (more like a pancake in this case.) 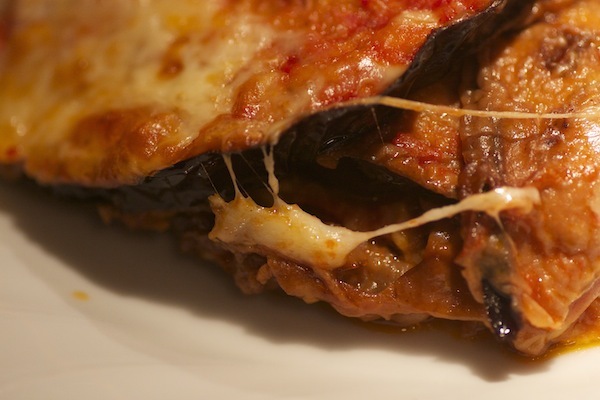 Cook it the same way as the eggplant. When it’s done, sprinkle a little powered sugar on top and enjoy! Besides being delicious, this snack might distract you from scarfing down tons of hot, crispy eggplant as it comes out of the pan. It also might not. I usually eat both, and chase them with large chunks of mozzarella. Extras are built into the recipe to allow for this unstoppable force. Assemble everything in a baking dish in layers. 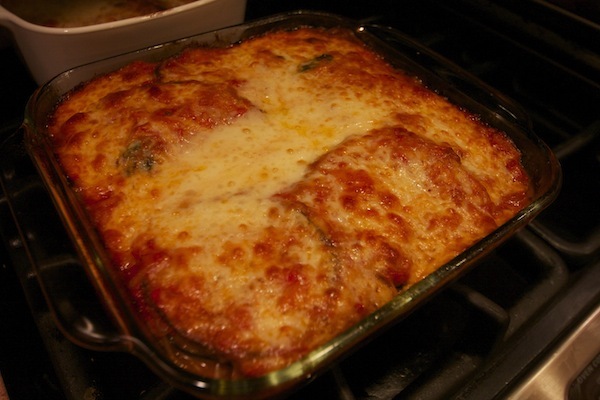 Start with a little bit of sauce on the bottom of the pan, then eggplant, mozz, parm, and a drizzle of sauce. Repeat until your tray is full. Only use a little bit of sauce in each layer so it doesn’t become too wet. 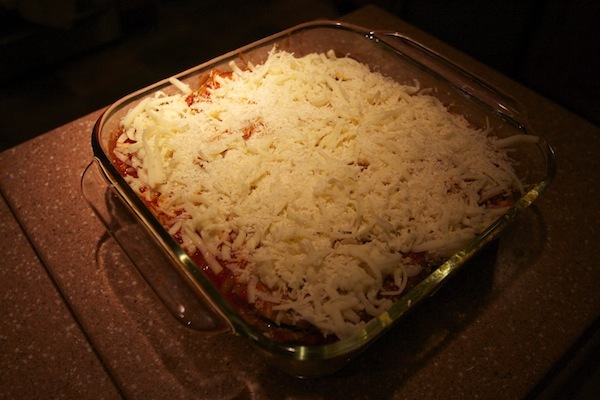 End with the cheese layer on top. Cover tightly with aluminum foil and bake for 45-60 minutes. Take the foil off for the last 10-15 minutes of cooking to let the top get crispy. Enjoy! Freeze whatever you can’t eat. This type of dish tastes better every time you heat it up. 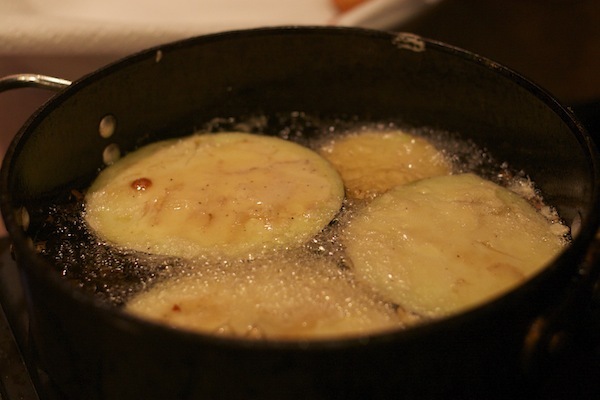 I would also just like to thank my good friend Jennifer for shooting the amazing photos for this blog while helping me fry eggplant for hours. They have added so much to this project, and I hope this is just the first of many collaborations between us. I mean, they’re incredible. I’m not the only one drooling on my computer, right?